Boeing Defence Australia has completed its 100th F/A-18A/B Classic Hornet Deeper Maintenance to the Royal Australian Air Force (RAAF). The completion represents more than 500,000 hours of work over four years to keep the Australian RAAF platforms in operation. 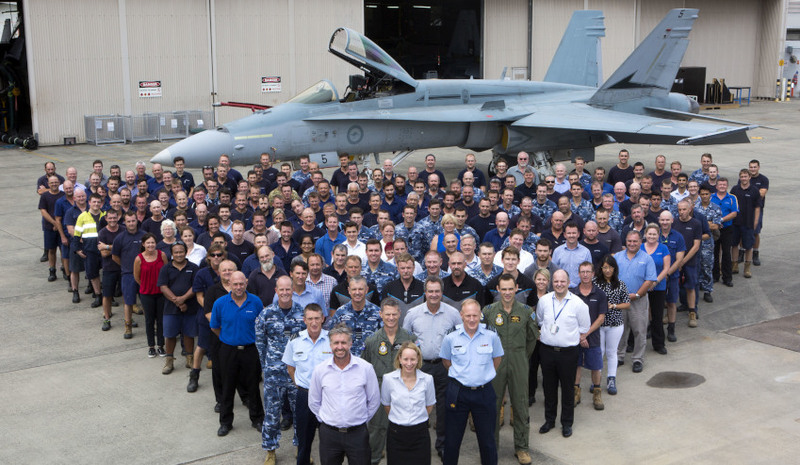 RAAF celebrated the milestone alongside the Boeing unit based at Williamtown, with an Officer Commanding No. 81 Wing thanking the team for their efforts and reiterating the important role Boeing plays in supporting mission readiness. "The incredible daily serviceability rates we’ve seen over the past couple of years have not been by accident. Without the co-ordinated and integrated efforts of Air Force, Boeing and other support agencies, we would be unable to sustain such a high tempo on operations in the Middle East and in vital training in Australia," said a No. 81 Wing spokesperson. Boeing Defence Australia integrated services and support general manager, Murray Brabrook said the Classic Hornet was a reliable workhorse in theatre, with the team maintaining around 10 aircraft at any one time during RAAF operations such as OKRA. "Boeing conducted 59 Classic Hornet test flights in 2016 alone, with the team at Williamtown working diligently to ensure we provide the RAAF with a quality product on time and within budget," said Brabrook. The aviation giant's deeper maintenance contract is valued at $64.8 million with an expiry date of 31 December 2020, and two separate one-year options to extend. Under the contract, Boeing is required to seek engagement of specialist Australian small- to medium-sized enterprises (SMEs) to deliver a complete and seamless DM Support capability. The required SME support represents approximately 2 per cent of the contract price.